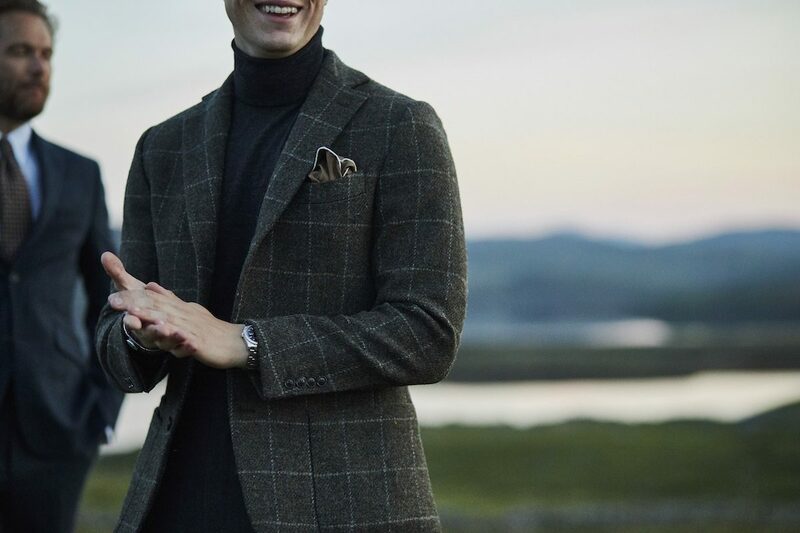 Following a caffeine-fuelled brainstorm in Florence earlier this year, The Rake has joined forces with two Scottish powerhouses to produce an extremely versatile Harris Tweed sports jacket that’s exclusive to The Rake. The Walker Slater x Harris Tweed x The Rake sports jacket embodies a country and urban aesthetic through the forest green and charcoal window pane check. Photo by James Munro. A cafe looking onto Piazza della Signora in Florence might seem like an odd place to embark on a three-way collaboration with two Scottish powerhouses, Walker Slater and Harris Tweed Hebrides. But, that’s where the story of producing this exclusive forest green windowpane tweed sports jacket, pictured above, began. At the tail end of Pitti Uomo on a crisp January morning earlier this year, over espressos and to-die-for pastries we discussed ways in which we could bring all three voices together and produce a jacket for Autumn/Winter 2018 that could be worn with flannel trousers or denim jeans. Overall, a jacket that is imbued with elements of understated sartorialism and British charm. This project thus far has been a pleasure to have been a part of. Walker Slater, helmed by the inimitable Paul Walker, and Harris Tweed Hebrides, creatively directed by Mark Hogarth, are equally eager to celebrate classical menswear as The Rake and are also a riot to work with. For one, Walker Slater are leading the way in tweed innovation, adopting contemporary yarns and patterns that rally against the fusty stereotype that the cloth is sometimes subjected to. In my opinion, tweed has the most interesting history of all types of cloth, one that’s endearing and tightly woven into its rich tapestry. It’s a cloth that deserves adulation for numerous reasons, too. Did you know, for example, that it’s protected by an Act of Parliament in order to protect the livelihoods of the inhabitants of the Outer Hebrides, a small cluster of desolate but stunning islands off the north-west coast of Scotland? The contemporary tweed specialist Walker Slater has numerous outposts across the UK. 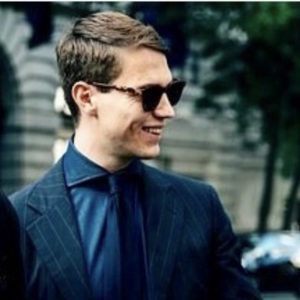 It’s an avid supporter of British-made cloth, be it flannel or tweed, and its styles of tailoring are named after stoic British names such as Edward, James and Francis. The exclusive model we've produced has been coined ‘Ronan’, which is the name of Brian Wilson, Chairman of Harris Tweed Hebrides' son. The jacket itself is a slight evolution of its more casual and fitted counterpart, the Edward, which happens to be Walker Slater’s best-selling single-breasted, notch lapel, two-button jacket (it comes with either two or three jetted flap pockets). The Ronan’s shoulder is slightly padded, but not too structured and we’ve taken in the shoulder half a centimetre and raised the armhole ever so slightly to give it more of a fitted silhouette. We’ve removed the flap pockets and replaced them with patch pockets, which “is a welcomed sartorial styling detail that is not only unusual but actually rather practical,” says Walker. These patch pockets are then complemented with a neat pattern matching of the windowpane, downplaying the formality of the silhouette so as to make it an ideal companion to smart-casual flannel trousers or even a pair of selvedge denim jeans. In the same way as the block is exclusive to The Rake, the dark green windowpane tweed is exclusive, too. “Tweed has sympathy towards the countryside but is very at home with an urban environment. I personally love a hard to identify, almost sludgy green that boarders on charcoal,” explains Walker. The subtlety of the charcoal ever so slightly adds a touch of an urban aesthetic, which is contrasted against the country-like green. As mentioned earlier, Harris Tweed is protected by an Act of Parliament, the Harris Tweed Act of 1993, which was introduced as a saving grace to safeguard the industry as it was in a serious fallow period. Today, though, it’s on a path that has an undeniable stratospheric trajectory, consistently seen in collections from Europe’s leading fashion houses, such as Chanel, to streetwear’s dominant force, Supreme, and everything in between. “Harris Tweed Hebrides have revived the Harris Tweed industry and they’ve created a process by offering such a great support network,” Walker adds. As governed by the Act of Parliament, to weave tweed and be granted the ‘Orb’ seal of approval, which is the oldest British trademark that’s been in continuous use since 1911, the Shawbost mill has to follow strict rules. Starting from the very beginning, Harris Tweed use virgin Cheviot wool which is mainly sourced from the Lowlands of Scotland. This is then cleaned and dyed and Harris Tweed then work off roughly 50 base colours, which can be found in nature all across the island. These dyes infiltrate every micron of fibre in the wool which gives it such wonderful depth that it’s become world-renowned for. The dyed wool is then broken up, mixed (which gives it its deep colour) and carded. It’s then spun eight to nine times to make a single-ply yarn that has at least two yarns. The warp consists of 1,416 yarns and is woven within the mill with each individual yarn being tied together end-on-end. It’s serious work that requires extreme patience and dexterous hands. Harking back to the Act of Parliament, it’s imperative that the warp is delivered to independent weavers, who are situated all over the island, and whom by law are obliged to apply the weft via pedal loom. This is the case for a number of reasons, but most of all it keeps the cottage industry alive and the island employed — it’s noble, skilled and peaceful work. This was the second time that I’ve visited the Outer Hebrides and met Calum George Buchanan, an ex-rally driver turned weaver. Conversing about weavers such as George, Hogarth says that, “we have a world-renowned fabric made by a remarkable community of people in a beautiful remote part of the world,” which couldn't be more true. For an urbanite such as myself, George’s modus operandi is about as far removed from my quotidian routine as it gets. He works calmly, quietly and deliberately, occasionally raising his head to peer out of the window and over an ellipse of sandy bay on a glorious blue-skied day. Explore the rest of the Walker Slater range here.